On arrival at the airport / railway station in Delhi, begin your tour 'The Golden Quadrangle - Summer' . You will be met and transferred to your hotel. Later, enjoy a city tour of Delhi including visit to Qutub Minar,Raj Ghat, Red Fort and drive past the Jama Masjid, India Gate, the President's House, Parliament House and the Government Secretariat Buildings. Note: Red Fort remains closed on Monday. Today, proceed to the pink city of Jaipur. On arrival, check into the hotel. The rest of the evening is at leisure for independent activities . This morning after breakfast, drive outside Jaipur to the ancient capital of Amer to see the fabulous Amer Fort followed by a visit to City Palace and Jantar Mantar. The Amer Fort is also known as the Amber fort. The construction of Amber fort was started by Raja Mansingh in the 16th century and was completed by Sawai Jai Singh in the 18th Century. The palace here has been wonderfully built and has an intelligent design. The palace has a four storied layout and each level has its own courtyard. The fort provides an amazing advantage point to view the entire expanse of Amer. Later, visit the City Palace - a palace complex in Jaipur, which is a splendid example of the foresight that Maharaja Sawai Jai Singh II had. It includes the Chandra Mahal and Mubarak Mahal palaces and other buildings. Finally visit Jantar Mantar or Astronomical Observatory - The collection of architectural astronomical instruments, built by Sawai Jai Singh, as he was particularly interested in learning about astronomy. It has been inscribed on the World Heritage List. Today, proceed to another historical and romantic city, Agra. En route, visit Fatehpur Sikri - a perfect example of fusion between the Hindu figurative decoration and the Mughal geometrical pattern. Later, visit the famous Taj Mahal - built by Mughal Emperor Shah Jahan in the 17th century as a shrine to everlasting love for his queen, Mumtaz Mahal. Also, considered to be one of the seven wonders of the world and recognized as a UNESCO World Heritage Site. In the morning, visit the Agra Fort - a UNESCO World Heritage Site, is a hilltop citadel with fabulous courtyards, fountains and gates. Later, drive to historical city of Gwalior. Today, visit the 9th century Teli Ka Mandir - It is touted as the oldest surviving structure within the Gwalior Fort. visit Sas Bahu ka Mandir - considered to be one of the greatest architectural marvels situated at the Gwalior Fort. Continue your tour visiting the tomb of Tansen - Tansen was a legendary musician and singer in the court of Mughal Emperor, Akbar. He is considered to be the father of Hindustani classical music and was one of the nine jewels of Akbar's court. 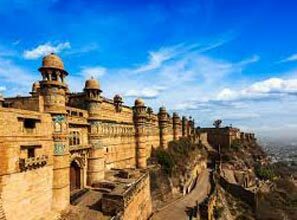 Tansen is buried in Gwalior and his tomb is a brilliant monument built in the early style of Mughal architecture. you are transferred to the airport / railway station in Gwalior for your onward journey.